Meet Brandon Perez, our 2019 USC Lats Legacy Baseball Scholar! 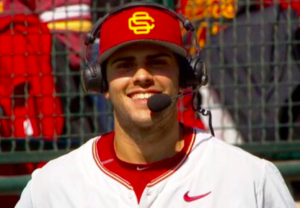 The Lats Legacy Foundation is proud to announce our third USC Lats Legacy Baseball Scholar, Brandon Perez. My name is Brandon Perez and I am in my senior year studying Real Estate Development. I currently live in Newport Beach, CA and after graduation, I plan on continuing my baseball career for as long as possible and then getting into commercial real estate. My favorite part about being on the baseball team is the amount of fun it is and the lifelong friends I have made each year. We are with these guys more than our own families and have become a family of our own. I am an infielder who has played short stop, third base and second base here at USC. What does it mean to you to be named the 2019 Lats Legacy Foundation scholar? It means a lot to be the recipient of the Lats Legacy Foundation Scholarship because it gratifies not only all my hard work that I put in on the field, but in the classroom as well.